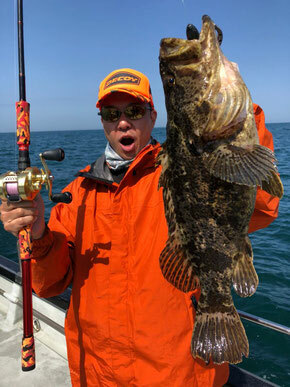 "Hit my first fish of the trip, a nice 48cm Rockfish, using the new KOZ C68 M rod. The hit by the fish on the soft plastic lure was pretty hard, but the moderately fast rod tip was able to set in the hooks. The fish attempted a few powerful runs back to it's home, however, the rod's strong back bone managed to stop it and put it under control. And after a few short minutes, the fish was landed, thanks to the new KOZ C68 rod." 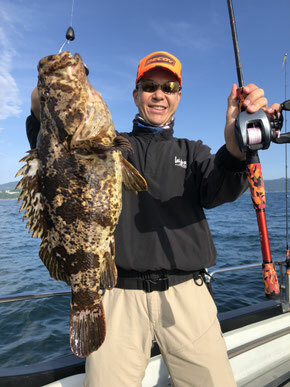 "2nd day of fishing for Rockfish, using the my new C77 SLH rod. While drifting over a large reef patch, I suddenly felt a strong tug on the line, followed by a strong pull, afterwhich i instinctively set the hook. The fast tip of the rod worked nicely to set in the hook. Through the fight, the fish made a few powerful runs, and i was surprised by the strength of the rod, stopping the fish in his tracks, and is even strong enough to pull through the kelp. After a short fight, a nice 48cm Rockfish was in the net. From this fight, i can tell that the C77 is truly built to handle Rockfish. Furthermore, the 7'7 length is great for casting long distances towards the rock edges. Fantastic rod! Caught this nice 80cm Suzuki with the new KOZ C77 SLH, along with the Buster Jerk II lure. 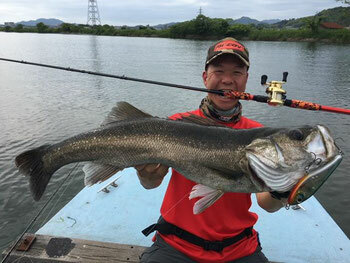 The strength of the rod was able to handle this large lure, without any over flex. When the fish struck the lure, the tip of the C77 was flexible enough to take hit, and yet strong enough to set the hooks. During the fight, the rod performed perfectly, with the back bone strong enough to control the fish. In addition, the 7'7 length was great for casting long distances, and the lightweight allowed for casting throughout the day. A perfect rod for handling big Suzukis." 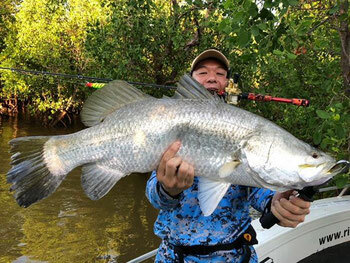 "Caught this nice 74cm Barra in my recent trip to Shady Camp, Darwin using my KOZ 510 rod. The rod performed perfectly, with the back bone strong enough to control the fish, preventing it from diving into the snags. The fish hit the lure pretty close to the boat, and was trying dive into the mangrove tree next to the boat, but the strong back bone of the rod stopped it, and after a short fight, was landed into the net. The shorter rod length of the 510 is great for casting in tight mangrove areas. I was so surprised at how well it performed as a Barra rod!" Copyright (C) SouthTimes All Rights Reserved.